2. 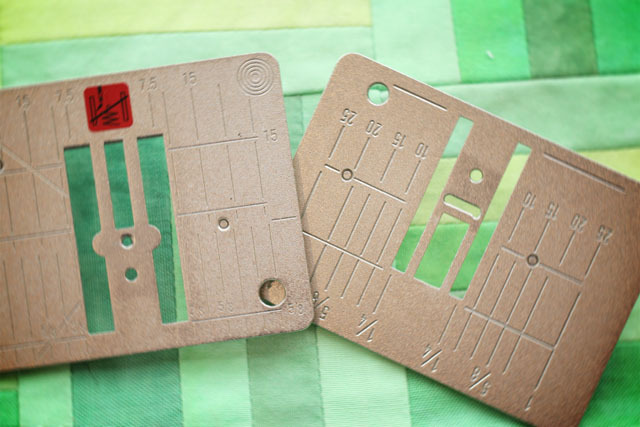 Insert a single-hole throat plate. Improves stitch quality. Not absolutely necessary, but I think it makes a difference. 3. 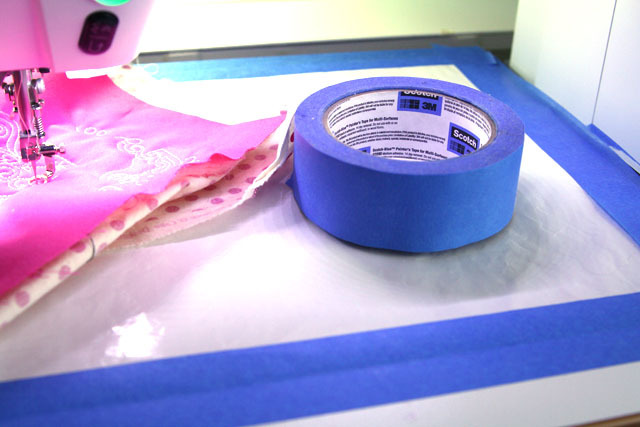 Tape down a Supreme Slider––The Supreme Slider–I always use a Supreme Slider. It is a teflon sheet that helps the fabric slide while stitching. It is essential! It comes in two sizes now–I have the small one and would consider the larger one if I ever needed to replace mine. The down side -it would require more tape. The product description claims that the Supreme Slider is self sticking—mine does not stick anymore– so I tape it down with 3M painter’s tape. The photo below: My Supreme Slider with enlarged cut out opening– The self sticking didn’t work and I stitched the teflon sheet onto the back of a quilt! —Hence, the taping! 6. 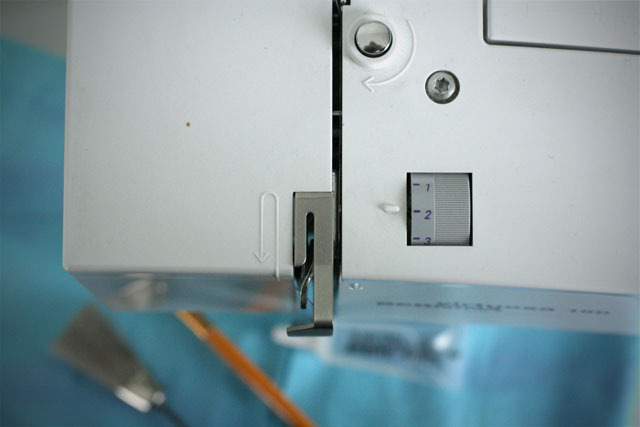 Machine Adjustments: Lower the Feed Dogs and Set Needle Down Position–In normal stitching (feed dogs up or engaged), the feed dogs advance the fabric. For free motion quilting, the feed dogs are lowered (disengaged) and the quilter controls the movement of the fabric. 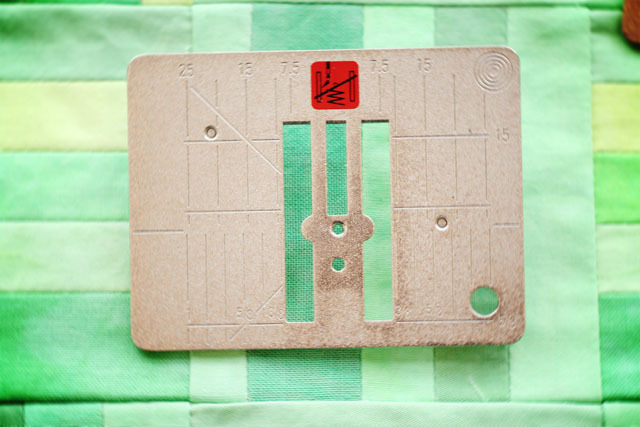 Some quilters set the stitch length to zero and leave the feed dogs engaged–give that a try. For my machine…my stitches are better with the feed dogs lowered. 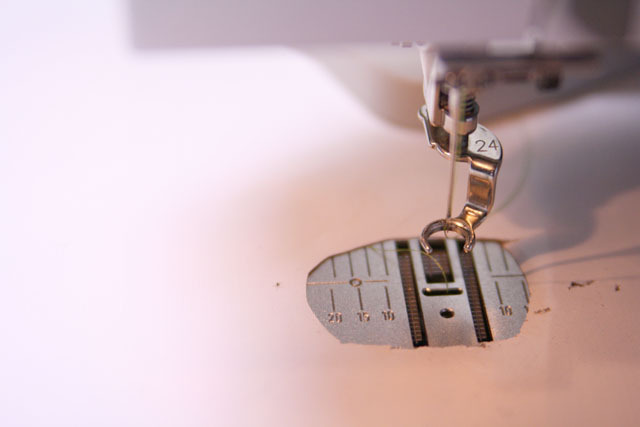 Many sewing machines now have the option to set the position of the needle when stitching stops. 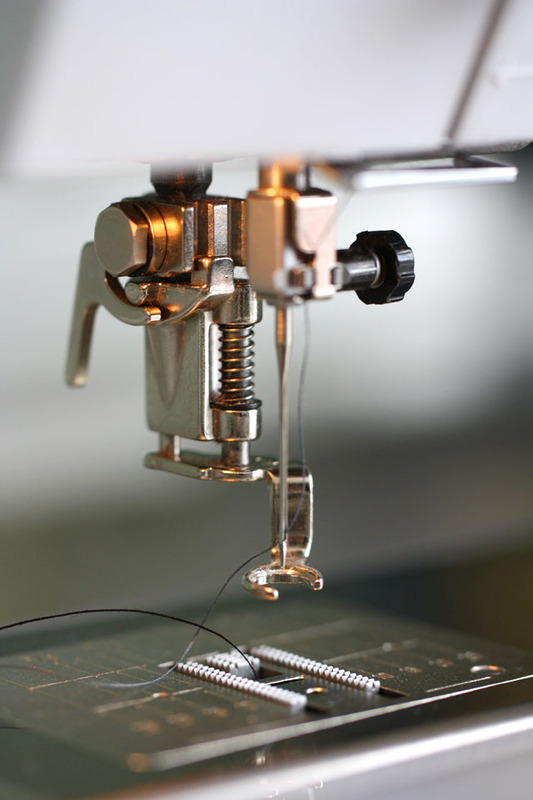 In older machines, whenever stitching ended, the needle returned to the “up” position–the needle was out of the fabric. 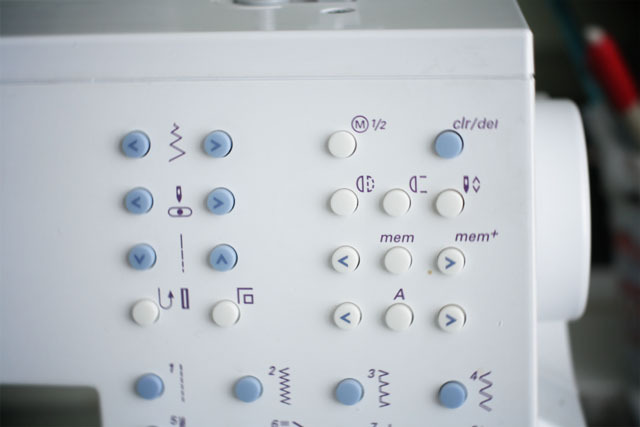 In free motion quilting, it is preferable for the needle to stop in the “down” position–with the needle in the fabric. In that way, the quilt can be repositioned and when quilting resumes, the stitch line remains fluid (at least that is the goal). 7. Adjust the top tension–I usually need to lower my top tension. 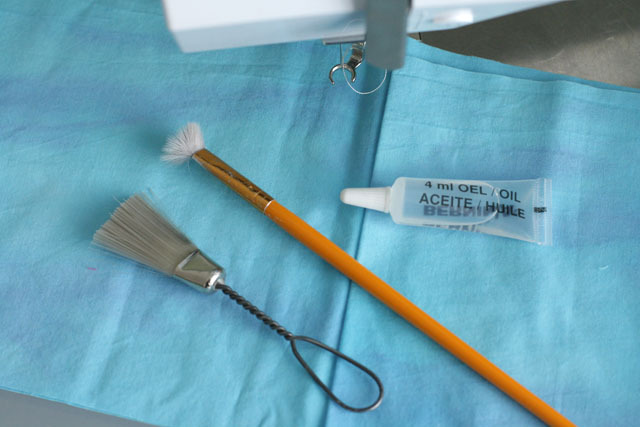 Stitch a sample and adjust the tension every time you start a new project. The tension is affected by thread, fabric, needle, and batting. I think it may also be affected by humidity. I usually leave a wide border on my projects so that I can do the test stitches right in the margin of the project. My Craftsy video Divide and Conquer 50% off (until May13, 2017) discount applied at check out…. I have a sepreme slider and if you rinse the sticky side with water, and let it dry, it will stick again! I bought the large size to fit completely over the hole where my sewing machine is set into the cabinet, and it works great! I also have a long arm machine, which I use for pantographs, but the more custom quilts require a more hands-on approach, much like this quilt you did for your sister. I do the same thing- stabilize first with in the ditch, and then fill it in as desired. I made my son in law a US Marine quilt and then stitched their themes like Semper Fi in the center of the stars- it came out great, much like your sister, grandmother, etc. I am fussy about the lettering, so I print off what I want on a thin paper off my computer and then stitch through it and pull off the paper. I use Lucinda handwriting and am able to produce a bold line using a triple stitch- takes FOREVER, as I have to start and stop and I knot the threads to the backside every time, but the result is perfect! I LOVE your tips and tutorials!!! I check out you blog every single day (while the kids are doing homework-than i have a couple of quiet moments) and it is the only one I read regularly. I just started a quilt where I use some of your ideas and it works well. I signed up in your craftsy class. you are an awesome teacher and you explain very, very well!!! 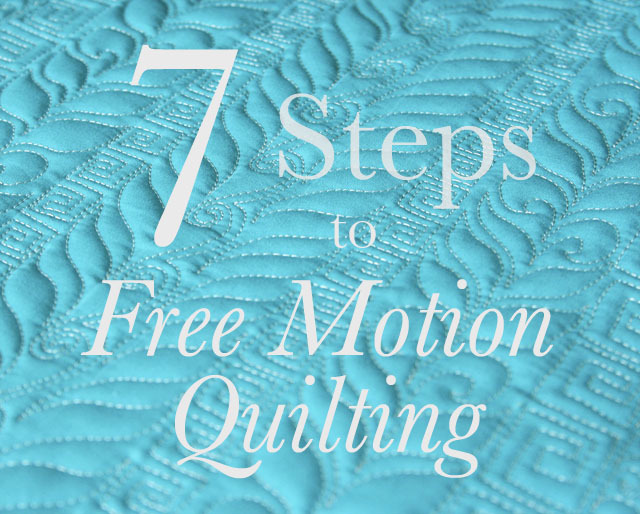 Going over some things on your blob and reviewed the 7 steps to free motion quilting. I noticed you tape your supreme slider as it doesn’t stick anymore. Read some of the answers and saw one that suggested you wash it. Have you ever used a baby wipe? It works like a charm. I keep a small packet nearby my sewing machine. Thanks for all the inspiration. Love the blog. That is a very good idea! That would make washing it so much more convenient!! Thank you! I use a baby wipe also. So easy as I have a plastic Costco container in my studio and it makes all kinds of clean ups a cinch! Thanks Lori for your tutorials and my beginning free-motion students love them also. I always reference your blog and NOW Craftsy classes for them to reference. Great idea! I’ll give that a try! What Needle Size Should I Use? 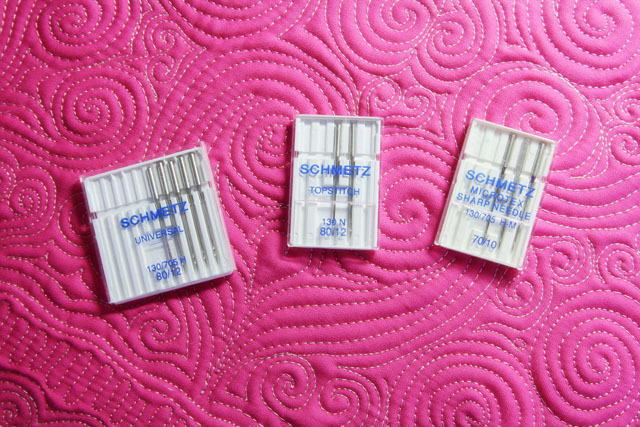 The Best Marking Pen for Machine Quilting!